Modern treatment of data requires powerful tools that allow the possible valuable contents of that data to be thoroughly understood and exploited. From the plethora of techniques proposed to achieve those objectives, the independent component analysis (ICA) has emerged as a flexible and efficient approach to model and characterize arbitrary data densities. Considering adequate data preprocessing, ICA can be implemented for any kind of data including imaging; biomedical signals; telecommunication data; and web data. In this framework, this book embraces a significant vision of ICA that presents innovative theoretical and practical approaches. 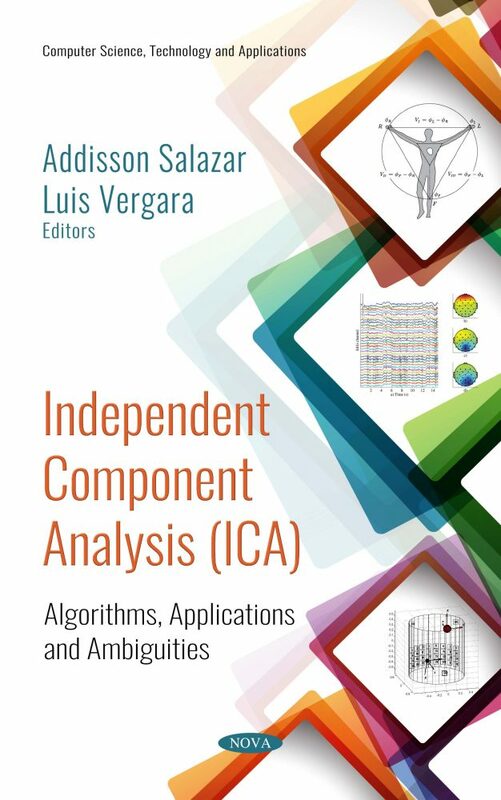 ICA has been increasingly studied as a suitable method for many applications where available data describe complex geometries. Thus, this book aims to be an updated and advanced source of knowledge to solve real-world problems efficiently based on ICA. In contrast to classical time and frequency domain filtering, ICA has been proposed as a statistical filtering tool considering the observed data as mixtures of hidden non-Gaussian distributions called sources. Those sources extracted by ICA can be related with meaningful information about the origin of the data and for data detection/classification. Therefore, the successful of ICA has been widely demonstrated in challenging blind source separation (BSS), feature extraction, and pattern recognition tasks. The suitability of ICA for a given problem of data analysis can be posed from different perspectives considering the physical interpretation of the phenomenon under analysis: (i) Estimation of the probability density of multivariate data without physical meaning; (ii) learning of some bases (usually called activation functions), which are more or less connected to the actual behaviors that are implicit in the physical phenomenon; and (iii) to identify where sources are originated and how they mix before arriving to the sensors to provide a physical explanation of the linear mixture model. In any case, even though the complexity of the problem constrains a physical interpretation, ICA can be used as a general-purpose data mining technique. The chapters that compose this book are written by premier researchers that present enlightening discussions, convincing demonstrations, and guidelines for future directions of research. The contents of this book span biomedical signal processing, dynamic modeling, next generation wireless communication, and sound and ultrasound signal processing. It also includes comprehensive works based on the related ICA techniques known as bounded component analysis (BCA) and non-negative matrix factorization (NMF).